Fluorescent tubes are a big part of many commercial properties: from parking garages, to hallways and office space. While fluorescent tubes were considered a great technology not too long ago, LED tubes are overtaking them in many aspects: performance, longevity and quality. A recent new technology which is taking commercial spaces by storm is the direct T8 LED replacement tubes that are now compatible with both existing fluorescent fixture ballasts or without. Why? There is no need to rewire the ballast – simply replace the existing tube with the direct replacement one and you’re good to go! 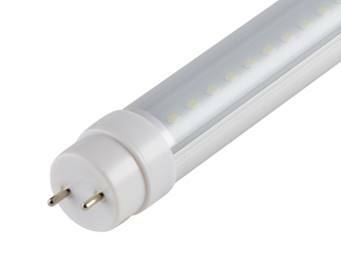 To the point above, the direct replacement LED tube works with most existing electronic ballasts. Just remove the existing fluorescent tube and replace with new LED tube. Assuming you have a standardized 4 or 2 foot fixture, these tubes fit in perfectly with all existing fixtures. While this tube is ballast compatible as soon as the ballast life expires you will have to have the fixture rewired. This is a bit of a bind but keep in mind that our direct replacement bulbs come with a 5 year warranty, meaning that if the bulb goes out you are covered. If it’s the ballast you will have to have the fixture rewired. Once re-wired, you only have to worry about the tube itself! The initial, easy replacement of the tubes is easy. However, the ballast will have to come out eventually – something to keep in mind when deciding to use direct replacement LED tubes. Assuming that the existing fixtures all have ballasts it will be a painstaking task to simply replace all fluorescents with direct replacements then once each tube goes out it will be difficult to determine if the ballast or the bulb need replacement. Particularly with a large number of fixtures such as an underground parking garage or multiresidential stairwells where lights are on 24/7. New fixture installations allow you to setup an infrastructure applicable to the specific property. Direct replacement tubes are meant to be exactly that: replacements. Type C LED tubes may be a better option as part of brand new fixtures. As a matter of fact these Type C LED bulbs now come with a 10 year warranty (from Metrosphere) and are an ideal option for brand new fixture investment. As you can see with the points above the direct replacement LED tubes are much better suited for residential applications (although commercial applications are common as well). It allows for quick and easy replacement of existing, burnt out fluorescents with little to no installation steps required. Eventually you will need an electrician to remove the ballast, which can be accomplished in a short and inexpensive manner.